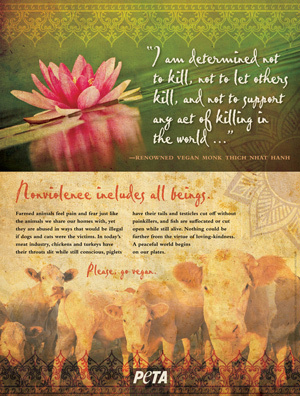 Dharma Voices for Animals (DVA) is an organization of those committed both to practicing the teachings of the Buddha (the Dharma) and to speaking out when animal suffering is supported by the actions of those in Dharma communities and by the policies of Dharma centers. We want to be the voice of the animals who cannot speak our language and are unable to ask, “Why are you paying people to do this to me?” or “Why are you supporting my suffering?” We want to support those who are willing to speak out about the harm we cause other sentient beings when we eat them, use their body parts as clothing and in other ways, or use household and personal hygiene products that are tested on animals. While DVA recognizes the challenges of living in a complex, modern society, we wish to promote the choices that provide the greatest reduction of animal suffering. It is our intention to be inclusive in honoring the different views of those who sincerely intend to minimize the suffering of animals. seeking refuge in the Buddha, Dharma and Sangha. When is the next conference in 2018? I like to print it in my mooncalendar 2018 for more people te read and know. Sorry for the long delay but we don’t have a staff and our volunteers have been really busy. Which conference are asking about? Our next one is in Colombo, Sri Lanka on October 26, 2017.